How do I eliminate (or reduce) the dynamic range? I have these podcasts, which I listen to while going to sleep. Unfortunately the volume sometimes suddenly goes up (e.g. when the guy talking wants to emphasize something). I would like the volume to be very equal over the whole file and therefore eliminate the dynamic range. What is the best approach to eliminate (or at least reduce) the dynamic range of an audio file? Can you refer me to a free (Windows or Ubuntu) tool I can use for this? I tried achieving it using the audacity application and applying the compression effect several times. It seems to work to some degree but I want to know if there is a better way (more effective or more efficient). You're heading in the right direction. Compression is what you need, though maybe you want more of it. A 'harder' version of compression is known as Limiting. Using a limiter rather than regular compressor adds a 'ceiling' above which signals cannot get louder. 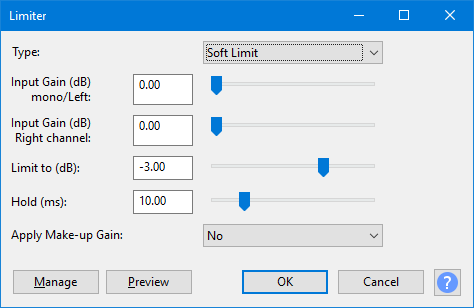 This will allow quieter sounds to pass unchanged, but anything above your volume limit [threshold] will be clamped to that limit. If your threshold is set too low, this can be quite nasty to listen to, but if you set it soft enough, or even temper the signal it's receiving by running through a gentle compressor first, it can sound OK. Some limiters have a value known as 'knee', described as 'soft' or 'hard' & which can soften the transition from gentle compression to hard limiting. I don't use Audacity, so I don't know the specifics, but I found this on their site - Audacity Manual - Limiter which looks like what you need. It has no graphical interface so you'll need to play with the numbers & test until you're happy. 'Soft Limit' looks to be a 'soft knee' curve. Not the answer you're looking for? Browse other questions tagged volume loudness dynamics or ask your own question. how do i create realistic sounding dynamics in the digital world? How much does a reliable dB-meter cost? how come some mp3's are louder then 0db? How to even speach loudness? How can I eliminate sounds below a certain threshold? (Noob) How to reduce and increase volume on a single track? How do I comply with the CALM act in the US with loudness levels? What is the difference between Audacity's dB and MP3Gain's dB?